This is more comfortable than the Plantronics HW540. It is an excellent replacement for the H81, H81N, H41, H41N, H141, H141N, H171 and H171N. 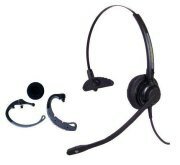 Plantronics discontinued the above headsets (TriStar, Mirage, DuoSet and DuoPro Models).